Each year I'm always desperate to see when I'll get my first ripe tomato. 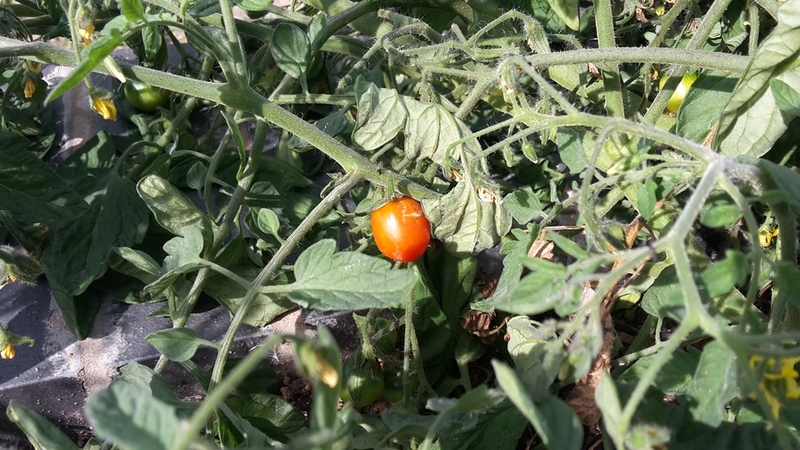 This year it's a rather small one and grown outside, but it's a ripe tomato no less! It was even smaller when I split it into three, but it saved arguments with my little ones! Hopefully many more to come now! Who else has had their first tomato? 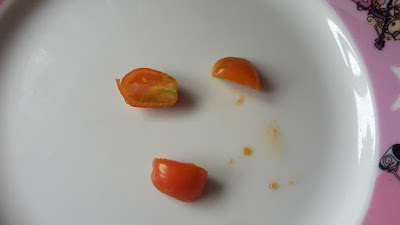 We've been picking indoor tomatoes for 2 or 3 weeks now (Sungold and Pear Drops). Outdoors just beginning to ripen (an old fashioned variety, Outdoor Girl). A few other varieties are not ready yet. I usually sow mine at the end of March but they soon catch up with those who sow earlier. Much better than me then. I've got about 8 varieties in though but all just taking their time. I find late sowings always catch up. Peppers onthe other hand are slow for me, considering grow lights for next year to get them off to a better start. You sound like me, waiting by the plant until the first one ripens. I've had a few Cherry Toms, but the big ones will be a while yet. My big ones are way off. I can't stop the boy picking green ones. I have a feeling we're going to fall out about it. Had our first tom last week! One of my favourite things is eating them straight out of the greenhouse, warm and delicious. I hate raw tomatoes so I never fight them for them! Cooked though and I'd have them with every meal! Both our indoor and outdoor cherry toms have been getting picked for just over two weeks now, but the 'biggies' are a fair way off yet! Our ten month old Grandson eats quartered cherry toms like sweeties! We are far behind you here in W. Canada. I planted 7 different varieties this year but none of them are doing great. Probably got 2 doz. small green tomatoes in total. The one year I didn't feed tehm enough and had a small crop. now I give them loads of comfrey feed and find that helps. i've picked 3 large red tomatoes so far! My girls just love them so much, they're waiting for them but can't wait until they're stealing them from the greenhouse!